A common question amongst those who like to grill is, should you leave the shell on when grilling shrimp? The answer to this question actually varies depending on the recipe and the cook. If you are cooking the shrimp in a simple fashion with no marinade or seasonings, then leaving the shell on will protect the moist meat inside. This allows you to prepare the shrimp in a peel-and-eat type of fashion, and for many, this is the preferred way to cook shrimp. Cooking the shrimp in their shells can intensify the shrimp flavor - so if you are looking for a strong shrimp flavor with moist and tender seafood, then the answer to "should you leave the shell on when grilling shrimp" is a resounding yes. When Is it Okay to Grill Shrimp Without the Shell? There are a number of times where it is perfectly fine to grill shrimp without the shells left on. If you'd like to impart a smoky flavor, then remove the shells and use a charcoal grill or a gas grill with wood chips. The shell will actually block and absorb the smoke in this instance, so it is best to remove it. If you are marinating the shrimp, then there is no need to cook them with the shells on. The shells can keep the marinade from infusing the shrimp meat. Not only that, but marinade adds moisture to this delicate seafood, meaning that it is less likely to dry out. Aside from determining should you leave the shell on when grilling shrimp, here are a few more tips for grilling delicious shrimp. Don't overcook it. Overcooking delicate shellfish always results in dry, chewy meat. Nobody wants that. The shrimp is done when the meat just turns from clear to opaque and the outside takes on a pink tinge. Use skewers or a grill basket to keep the shrimp from slipping through the grate. Shellfish soaks up flavor quickly, so it isn't necessary to marinade the shrimp for any longer than 30 minutes before tossing it on the grill. 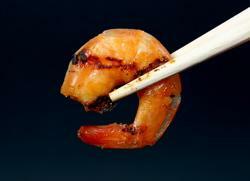 If you use a marinade that contains an acid like lemon juice or vinegar, these acids will partially "cook" the shrimp. Watch cooking times of shrimp marinated in this fashion closely to make sure shrimp doesn't wind up tough or overcooked. Should you leave the shell on when grilling shrimp? In the end, the answer is entirely up to you.